An essential ingredient for life has been discovered on Mars. It's the information we've all been waiting for. The Curiosity rover has discovered something incredible on the surface of Mars: nitrogen. While analyzing sand from the surface of the Red Planet, Curiosity detected nitric oxide in the sand's chemical components. Nitric oxide has been a staple on Earth, but Mars was an entirely different story. Although it's been speculated that nitrogen could be present on Mars, this is the first real confirmation of the existence of nitrogen on Mars. Published in the Proceedings of the National Academy of Sciences, the nitrogen found "may indicate the first stage in development of a primitive nitrogen cycle on the surface of ancient Mars and would have provided a biochemically accessible source of nitrogen." But don't get too excited yet. 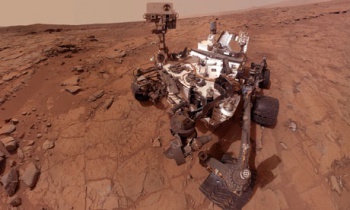 NASA itself has stated that "the [Curiosity] team thinks the nitrates are ancient, and likely came from non-biological processes like meteorite impacts and lightning in Mars' distant past," as Mars it too inhospitable to host any sort of life as we know it. However, this is still exciting news whether the nitrogen is, in fact, ancient or an underlying discovery of something altogether more intriguing. In the meantime, I'll just be over here daydreaming about the other fascinating discovers that might come out of Curiosity's time on Mars.